How Do Sore Feet Affect a Person's Golf Swing? Sore feet can limit your follow-through during your golf swing. Playing a round of golf with sore feet can be challenging and painful to the point that even if you love golf, you might choose to forgo the sport to avoid excess foot pain. Using a power cart is a method that helps you alleviate pain from walking the course, but if your feet are sore, the act of swinging a golf club can be a burden. If you have sore heels, toes or balls of your feet, you might favor one foot over the other. Doing so creates challenges to your golf swing, which requires balance to be smooth and correct, especially during setup. A person with one foot more sore than the other can unknowingly put more weight on the foot with less pain. This awkward stance reduces your balance, resulting in an unnatural swing. In a golf swing, the follow-through is just as important as the moment of impact. If you cut your follow-through short, it's likely that your shots will be wayward. If your toes are sore because of arthritis or other concerns, your swing and follow-through will be painful. Because your follow-through relies on the big toe on your back foot, you might lift the back foot or rotate it to avoid pressure on the toe. A significant element of a golf swing is the transfer of your weight from your back foot to your front foot at the moment of impact. If your feet are sore, this crucial part of your swing will not only be painful, but also it will be awkward. If you have a sore front foot, for example, you might unknowingly hold off transferring your weight for a fraction of a second to prevent a flare-up of pain. This delay is likely to result in a shank, which is a dreaded shot that goes directly to the right at a severe angle. Improve the quality of the insoles in your golf shoes. Most shoes have basic insoles that don't provide enough support for people with foot pain. Gel-filled insoles or foam insoles provide padding to your feet to reduce some of the pain. For the best relief, invest in custom orthotic inserts fit by a doctor. Your insurance may even pay for them. Also try a better quality of shoes that fit your feet properly. If the issues with your feet are severe, visit a doctor or podiatrist to get a diagnosis and medical solutions. Your doctor may recommend stretching exercises and physical therapy, braces, steroid injections or even surgery. 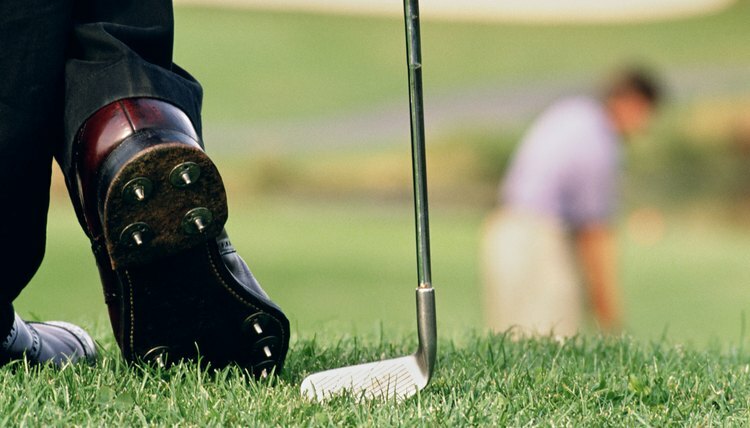 Medical News Today: Foot Pain Ruining Your Golf Swing? Can Exercises Help Avoid Knee Problems & Replacement?